Activity in August in the hockey calendar is infrequent, but not unheard of, even as the days march toward September. The Washington Capitals dipped into the free agency pool in late-August 2005 to sign a lanky former first round draft pick had a considerable climb up the depth chart at forward for the team that drafted him. David Steckel was drafted by the Los Angeles Kings with the 30th overall pick in the 2001 draft after a fine freshman season at Ohio State University. He spent three more years at OSU, recording 50 goals and 105 points in 146 games. Upon completing his NCAA apprenticeship, he moved on to the Manchester Monarchs of the AHL in the first pro stop of his career. Steckel’s first (and only) season with the Monarch’s – 2004 2005 – coincided with the last season Bruce Boudreau spent behind the Manchester bench as head coach. 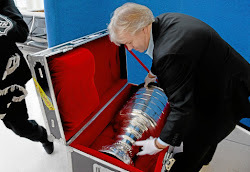 Both would find their way to the Capitals’ organization the following summer, Boudreau in July (signed on to coach the Hershey Bears AHL farm club) and Steckel on this date in August of that year. After spending two years with the Bears (each with a couple of brief stints with the Caps), the first of which ended in a Calder Cup and the latter of which was a 30-goal season (ending in the Calder Cup final), Steckel made the jump to the big club for good in 2007-2008. Steckel toiled in relative obscurity as a bottom six center who had heavier defensive responsibilities and who was an excellent faceoff performer. In his first 267 games with the Caps, he posted a modest scoring line of 22-33-55, plus-2. It was his 268th game with the club that would be memorable, although not for anything he did at the offensive end of the ice. While there was concern about Crosby’s condition as he left the ice at the end of the period, the magnitude of the incident would take on a life on its own, especially after Crosby was hit once more by Victor Hedman at the end boards in a game four days later that would be his last game of the 2010-2011 season and his last until late November of the following season. All in all, Crosby missed 102 of the Penguins’ next 124 regular season games following the Hedman hit through the end of the 2011-2012 season. It would be Steckel, though, for whom most of the ill feeling was directed. Perhaps it was a product of the magnitude of the game in which the event occurred, perhaps it was a product of the incident occurring against a heated rival, but there was no shortage of opinion that Steckel was the villain in this case. It might have started with Crosby’s comments just days after the incident. But, as the games passed with Crosby out of the lineup, there was the gnawing feeling that Steckel was being viewed as a dirty player, despite nothing in his history to suggest such a view. Some (well, one) responded with a frame-by-frame look at the hit that suggested it was just an unfortunate accident. In any event, the incident would follow Steckel around, even after he left Washington. As it was, he would leave Washington that same 2010-2011 season, traded to the New Jersey Devils in late February with a second round draft pick for center Jason Arnott. But David Steckel as a Capital will not be remembered for a goal as much as a chance collision far from the puck with the game’s best player on the biggest regular season stage. None of that would have happened but for what happened on August 25, 2005. We are back with another in the occasional series this summer of “What If This Day In Caps History Didn't Happen Like This Day In Caps History?” And that brings us to August 18, 2005. The summer preceding the 2005-2006 season was a busy one for the Caps, made more so because the club was in the midst of a rebuild, bid farewell to a number of players before the 2004-2005 lockout, and had to cobble together a full roster with so many youngsters still in development. In the space of eight days in early-August, the Caps traded for Chris Clark, signed free agents Andrew Cassels and Lawrence Nycholat, dipped into the free agent bag again to sign Mathieu Biron and Ivan Majesky, obtained Bryan Muir from the Los Angeles Kings for future considerations, and then signed Jamie Heward and Boyd Kane. It was a busy eight days. The Caps could be forgiven for going quiet on the personnel front for six days, but on August 18th, they added veteran forward Matt Bradley. It was just another signing, or so it seemed at the time, among a blizzard of them for the Caps, the sort that gets perfunctory attention in the media. Bradley made his Capitals debut on the same night as prized rookie Alex Ovechkin, although he did not have quite the introduction to Capitals hockey that Ovechkin had (two goals in his NHL debut). Bradley skated a team-low 8:51 that night against the Columbus Blue Jackets, going without a point, but recording three hits to give a glimpse of the sort of “energy” player he would become with the club. Bradley, who was not a prolific scorer in 203 regular season games over four seasons before arriving in Washingon (19-26-45), was a meat-and-potatoes sort of grinder who would do the dirty work in the corners and in front of the net, get under the skin of opponents, and stand up for teammates when the need arose. In those first 203 regular season games before joining the Caps he had 24 fights, including a career high 11 with the Pittsburgh Penguins in 2003-2004, his last season before coming to D.C.
At about the 1:25 mark of the clip, you can see Bradley, who just hopped off the bench, make a bee-line to Steve Downie to keep him from renewing his antics with Alex Ovechkin from earlier in the contest. Bradley was hardly shy about sticking his nose into such situations. But those situations, as frequently as they might have occurred for which Bradley sacrificed his body, might not be the moment that Caps fans remember. Everyone remembers Sergei Fedorov’s wrister that beat Henrik Lundqvist to give the Caps a 2-1 lead and, ultimately, a victory in the series. But back up the clip to the 10-second mark, when Matt Bradley takes a hit at the boards to make a play, a backhand pass to Fedorov exiting the defensive zone to start the rush that ended in the series-winning goal. What makes the moment even more bizarre, and what might be the ultimate anonymous hockey grinder moment, Bradley did not even get a “plus” on the goal. Immediately after making the pass, he went to the bench in favor of Viktor Kozlov, who took the ice and would get the “plus” in Bradley’s absence. Bradley played two more seasons with the Caps, never flinching from his role as a stand-up, high energy player, but one who could chip in with a timely goal. The physical edge with which he played took a toll, though. After appearing in 81 games in 2008-2009, he played in 77 games in 2009-2010 and 61 games in 2010-2011. After that 2010-2011 season, he signed a two-year contract with the Florida Panthers as a free agent. In February of his first (and what would be only) year with the Panthers, he suffered a concussion that limited him to 45 games in what would be his last season in the NHL. Some free agent signings are accompanied by a lot of hoopla, and others are merely one-line of type buried deep in the sports pages. Matt Bradley’s signing with the Caps on August 18, 2005 probably qualifies as the latter, but he gave the Caps their money’s worth and played a lot noisier than “just another signing” might be expected to perform. And absent that signing, the Caps might have been denied not only one of the most memorable goals in the history of the franchise, but might very well have been eliminated long before such a chance would ever present itself. Even for grinders, there is a special place in hockey, and Matt Bradley occupies his in Caps history. Some days in Caps history mark significant milestones or important events. Others are just, well…odd in an unexpected way. Such was August 10, 2005, in Washington Capitals history. The day before, the club signed free agents Andrew Cassels and Lawrence Nycholat to help fill out a rather thin squad as the team was headed toward their first training camp since the 2004-2005 lockout. On this date, the team signed two more players, both defensemen – Mathieu Biron and Ivan Majesky. Both were 20-something players who had knocked around a bit. Biron was 25 years old but already had five NHL seasons on his resume. He also had four NHL stops on that resume – Los Angeles (who drafted him, but for whom he never played a game), the New York Islanders, the Tampa Bay Lightning, and the Florida Panthers. Majesky got a late start on his NHL career, not appearing in an NHL game until he was 26 years old, with the Panthers, but he had both the Panthers and the Atlanta Thrashers as stops in his two-year career before landing in Washington. It could reasonably be said that neither Biron nor Majesky would be considered among the top 50 defensemen ever to pull on a Capitals’ sweater (they rank 92nd and 88th, respectively, in games played for the franchise among defensemen). In fact, for both Biron and Majesky, their first seasons with the Caps in 2005-2006 would be their last seasons with the Caps. Their last seasons in the NHL, in fact. Not that they were bad, in the context of their respective careers. Biron would tie a personal best of 13 points in 52 games played with Washington, while Majesky appeared in 57 games for the Caps. So, what makes this date and these two defensemen worthy of notice? Actually, it is Majesky that is of particular interest here. Not for his body of work, which was unremarkable on an unremarkable team. It was for a moment, a single play. Consider that Majesky is one of 13 defensemen since the 2005-2006 season to record a single goal in a season and have that goal be a shorthanded one (oddly enough, he was not the only Capital to do it; Jeff Schultz did it in 2008-2009). What makes Majesky’s moment memorable, a glimmer of joy in what was otherwise a period lacking in success, were the circumstances surrounding the goal. The date was March 8, 2006. 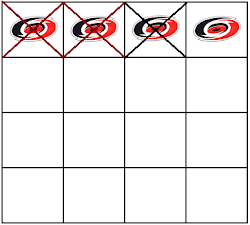 The Caps were dead last in the Southeast Division, sporting a 21-33-6 record. It might have been the worst record in the Eastern Conference but for their opponent that night. The Pittsburgh Penguins were waddling along with a 14-36-12 record, worst in the entire league. It was a lighthearted moment in a 6-3 Caps win against perhaps their most bitter rival, even if both clubs were in the midst of rebuilding efforts. But for a stroke of a pen in August of 2005, Caps fans – not to mention Majesky himself – would have been denied this odd, yet charming moment in history. When the calendar rolls over to August, you know you are in the deep summer of hockey. Players might be back home or with their families on vacation, the members of the hockey media might take the month to recharge before training camps convene in September. But even while the pace in front office might bend to the rhythm of the summer season, there is occasional activity. Sometimes, it is even consequential. One of those instances took place on August 4, 2005. Barely a month before training camp started for the 2005-2006 season, the Caps traded a sixth round pick in the 2007 entry draft and a seventh round draft choice in the 2006 draft to the Calgary Flames for a seventh round pick in the 2007 draft and winger Chris Clark. Clark, who had last been seen in the Stanley Cup final in 2004, before the NHL went dark for a season due to a lockout, was coming off three consecutive 10-goal seasons with the Flames. By the standard of the times, that being the latter stages of the dead-puck era, 10-goal seasons were not bad, but Clark was thought of more as a grinder, a player who would do the dirty work in the corners and in front of the net to create space and chances for more skilled forwards. No one could have foreseen that upon becoming a Capital, Clark would double his goal output to 20 in his first season with the club and would record his first (and only, as it turned out) 30-goal season in the NHL the following year (including nine power play goals, almost doubling his career power play goal output in his career to that date). It was in that second season with the Caps that he endeared himself to Capitals Nation for demonstrating just what “hockey tough” means. Having been named captain entering the season, Clark was leading by example late in regulation in a November contest against the Boston Bruins. With just over a minute left, he took a puck in the face that knocked out two teeth and crushed his palate bone. And yet, he finished his shift. He recorded neither a point nor a shot in that game, but it served as an object lesson to his young teammates on toughing it out. He missed just two games before returning to the lineup, further cementing his reputation as a tough player. The 2006-2007 season would be a career high-water mark for Clark, though. 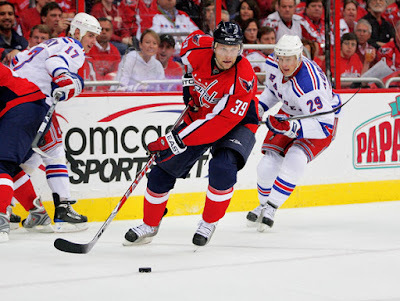 Injuries led to large chunks of lost games, and he recorded just 10 goals and 30 points in 88 games over parts of the next three seasons before being traded to the Columbus Blue Jackets with defenseman Milan Jurcina for forward Jason Chimera in December 2009. Clark finished that season and played one more in Columbus before his career came to an end at age 34. But what if August 4, 2005 came and went without a trade? Would things have been different? It’s hard to say that keeping those late-round 2006 and 2007 draft picks would have made a difference for the better, or for the worse, for that matter. However, those were the first two seasons in which Alex Ovechkin skated with the club, and he did not have a wealth of offensive talent surrounding him, even with Clark. In his rookie season in 2005-2006, Ovechkin (52 goals) and Clark (20) were two of four 20-goal scorers for the club (Dainius Zubrus and Matt Pettinger were the others). Their 72 combined goals accounted for 25.7 percent of the club’s total. 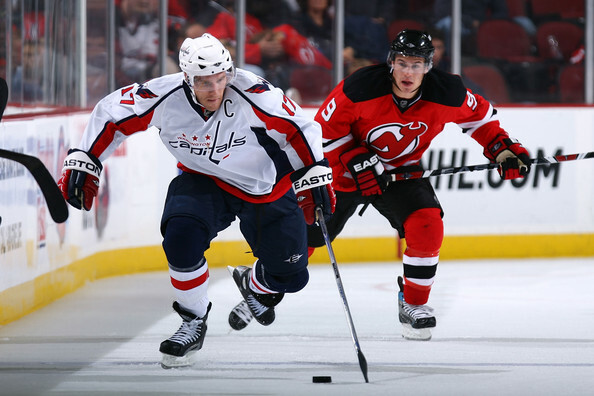 The following season, Ovechkin (46 goals) and Clark (30) accounted for 32.5 percent of the team’s total goal scoring. The question becomes, did Clark’s presence and production make a difference in the early formative years in Ovechkin’s career, or would his absence have been reflected in more attention focused on Ovechkin with less production as a thinner lineup failed to provide enough offensive support to take the scoring burden off the youngster? In that first season for Ovechkin, he opened on a line with Zubrus and Jeff Halpern, veterans in their own right. Zubrus was a veteran of 539 regular season games going into that 2005-2006 season, while Halpern dressed for 368 games before Opening Night in 2005-2006. In fact, that Ovechkin-Halpern-Zubrus combination also closed the season and was intact for much of the intervening schedule. The following season opened with Ovechkin on a line with Zubrus and Richard Zednik, while Clark was skating with Alexander Semin and Kris Beech. That lasted one game, a 5-2 loss in New York to the Rangers. 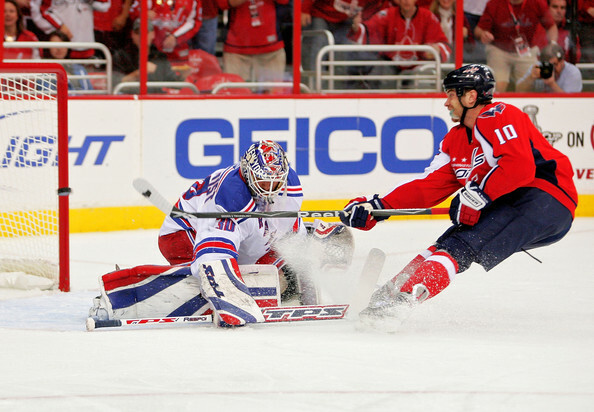 In Game 2, the Caps’ home opener, Ovechkin scored a pair of goals, Clark assisting on both. It was, as they say, the beginning of a beautiful relationship. Clark skated with Ovechkin and Zubrus until the latter was traded to the Buffalo Sabres late in the season, Kris Beech filling in at center for the most part thereafter. But Clark and Ovechkin were fixtures on that top line. It mattered. Although the Caps struggled overall in the 2006-1007 season, they won just one of the eight games that Clark missed that season (1-4-3). Ovechkin did fine in Clark’s absence over those eight games, going 5-4-9. The rest of the team, however, could not make up the scoring, averaging 2.50 goals per game while averaging 2.89 goals per game with Clark in the lineup. Those eight games missed offer a window into what things might have been like had the trade not been made for Clark. His influence on Ovechkin’s development, in terms of the raw numbers, appears negligible. But he provided hard minutes and consistent production, the latter being a rare commodity with those first two teams coming out of the lockout. One cannot help but think the Caps, unsuccessful as they were in those first two years, might have been worse. And that is where things could have gone sideways in terms of the timeline. It is possible that the Caps could have finished more than five points worse in the 2005-2006 season, which could have left them with the third overall draft pick instead of the fourth pick. Caps fans know that the club selected Nicklas Backstrom with the fourth overall pick. But picking third, Jonathan Toews (who was taken with the third pick by the Chicago Blackhawks) would have been available. General Manager George McPhee might still have taken Backstrom, who he preferred to Jordan Staal, taken second overall in that draft by the Pittsburgh Penguins. But, if there was some uncertainty in which direction the Caps wanted to go, perhaps there was room for a deal to be made to allow the Caps to move down in the order and still get Backstrom. The 2007 draft might have been more intriguing had Clark never come to Washington. The 2006-2007 Caps struggled once more and finished only two points ahead of the Los Angeles Kings and thre ahead of the Phoenix Coyotes. The Caps, without Clark, might well have finished with the second-worst record in the league, and even if the Blackhawks still won the ping pong ball draw to draft first overall, the Caps would have had the third pick, not the fifth with which they selected Karl Alzner. But before you spend too many brain cells on this, the 2007 draft does not seem, in retrospect, to have been a deep draft. Chicago would have taken Patrick Kane, as they in fact did, and the Caps might have taken James van Riemsdyk (taken second by Philadelphia in real time) or Kyle Turris (taken third in real time by the Coyotes). Ot they might have taken Thomas Hickey, who was the first defenseman taken in the draft, one spot ahead of Alzner, but who didn’t become a full-time NHL player until the 2013-2014 season with the New York Islanders. Then there is the matter of coaching. Glen Hanlon had the misfortune of trying to guide this young team through the formative stages of its development. Having a veteran such as Clark helped in ways tangible (goals and assists) and intangible (experience). In his absence, the team might not have been hard-working but unsuccessful, just bad. Worse seasons than the ones the Caps had might have hastened a coaching change (Hanlon was relieved by Bruce Boudreau in late November of the 2007-2008 season). Perhaps Boudreau, who was coaching the Hershey Bears, is elevated in the off season following the 2006-2007 campaign. Or, with more time to deliberate and consider possibilities, the Caps go in an entirely different direction in favor of a head coach with more experience. Would Claude Julien, who was fired late in the 2006-2007 season, come up on the Caps’ radar (he went to Boston that summer)? Would free agent head coach Mike Keenan have been considered (he went to Calgary)? Chris Clark had his greatest team success with the Calgary Flames, reaching the 2004 Stanley Cup final, but he had his most successful years individually with the Capitals. His 20 and 30 goal seasons are largely lost in what was at the same time part of an unsuccessful stretch in team history but the first years in the spectacular career of Alex Ovechkin. However, his work ethic, consistency, and toughness allowed him to carve out a couple of fine seasons in the midst of the team’s struggles and gave the club some ballast, a foundation upon which the young guys could learn what it takes to play at this level. The odd part about speculating on what might have happened had Clark never come to Washington is the scope of possibilities and the consequential nature of them. The Caps might have looked very different on the ice with the high draft picks they might have made and behind the bench, depending on the timing of coaching changes they might have made. One cannot help but think that the Caps are better today for having had Clark pass though Washington, although in ways that might not be immediately apparent.